This video is of Phil Mickelson talking his way through how he hit a pitch shot off a cart part. He goes into some detail but most of it is actually set-up and getting ready for the strike. He actually keeps it really simple which I think would enable anyone to give it a go. Here’s a question for you Lukey? (and everyone else who would be scared of damaging their sandiron). Would you be prepared to try this shot (or one like it) and possibly scratch, mark or scrape your club (but not do any real damage) but actually learn something really valuable? If so, then what are you waiting for? I’m sort of picking on Lukey a little here – but what damage could you really do? Seriously, a scratch or a nick is the worst thing. 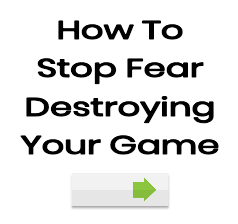 Fear (our Pesky brain) comes up with all sorts of reasons why we shouldn’t do something – but usually, these are the things we should be having fun with. I can see young kids the world over trying this shot from concrete and having a ball – they’ll be learning and trying to emulate Lucky Phil. But there’ll also be a heap of “older” guys too scared to get off the couch and try it for fear of damaging the club. The club damage isn’t the real cause – but Pesky’s excuse for you to stay put and not challenge the status quo. Got to love Phil, he’s a short game genius. But he’s right, if you apply the basic fundamentals to the shot and don’t make it more complex than it needs to be there’s no reason why the rest of us couldn’t play it. Interesting comment Cam. I noticed in the video that it looked like his regular sand wedge – ie it had a well worn face from a lot of use. Its not as if he used an old beater or something. I was like Lukey thinking “ouch, my poor club” but you’re right – just whack the thing. Dings and dents – meh. I scratched my new Schilke trumpet the other day and finally got over myself and just started PLAYING the thing – especially after I looked up a video of Chris Botti playing and his old Martin Committee trumpet had scuffs and wear all over it from so much use. Check out the Fender Telecaster that Francis Rossi from Status Quo still uses from when he started the band in the early 60’s(!) – it looks like its been run over by a couple of road trains (probably has actually). I reckon you can always tell a “player” over someone who turns up and thinks he’s a golfer just by looking at their clubs. The “players” clubs are typically scratched and marked and have some character – while the other guy probably still has his iron covers on. Thats it, those iron covers are going in the bin…. The shot has the same fears similar to not wanting to take a divot when you forgot your sand bucket. high percentage skulling the ball. Same rules apply. If you worry about the little stuff you won’t get the good stuff. Sometimes we’ve got to swing like there’s no tomorrow and forget about the consequences. Phil is respectful, quick an easy tip. Just because you don’t get paid to play doesn’t mean you can’t play good golf. Thanks for sharing.